Group B, the group that has two of Britain’s three hopes in the tournament and arguably the most realistic of them all, England. 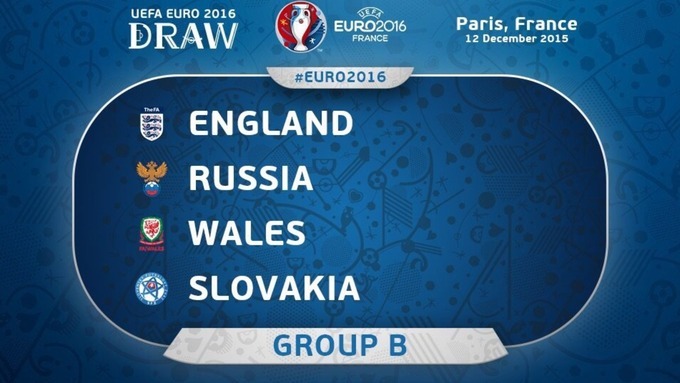 Looking to better England will be rivals, Wales as well as Russia and Slovakia. Whilst England may well be the most complete team in the group, each team has some outstanding players. Harry Kane – Harry Kane had an exceptional season for Tottenham Hotspur and England, scoring 25 goals in 38 Premier League games and also scoring in 2 of the 3 games he played for his country in 2016. In qualifying, Kane scored 3 goals and given the fact he only played in 5 games in total, that is a pretty decent return. Kane has multiple options for strike partners with Daniel Sturridge, Jamie Vardy, Marcus Rashford and Wayne Rooney all making the squad and any of those four players can take enough attention away from him to open up chances for the Spurs man to strike. If England progress into the latter stages of the tournament as expected, Kane may well make a run at the Golden Boot this summer. Many an optimistic fan will expect England to win the Euros and of course they have every possibility of doing so – the problem is England’s record in major tournaments. They have won just one major tournament, the World Cup 50 years ago. They have gone close since (Euro 96′) but since then, they have failed to get past the Quarter-finals in either the Euros of the World Cup and didn’t even qualify for Euro 2008. Their finals pedigree is not great of late so there is reason for concern but this is in an exciting squad this time around, with two red-hot strikers in Kane and Vardy and that may be the difference. A realistic expectation would be the Quarter-finals but the Semi-finals are also within their reach. If this squad plays to its full potential anything is possible but it will be important for the Three Lions to put a better group performance in than they did two years ago at the World Cup in Brazil. Artyom Dzyuba – Alan Dzagoev would have been in the discussion for top performer for this side, had he of not withdrawn from the squad with a broken metatarsal and as a result, Dzyuba will take centre stage. Dzyuba scored 8 goals, joint most with Zlatan Ibrahimovich in qualifying Group G and Russia will be relying on his goalscoring ability at the tournament. He has scored 8 goals in 17 appearances for his country and he was equally impressive for his new club, Zenit St. Petersburg in his first season, scoring 15 in 30. Since he moved to the club from Spartak Moscow last year, he has been a revelation after a largely unsuccessful start to his career. His game is built around physicality using his height and strength to get himself in goalscoring positions and he will no doubt be the key to any success his nation enjoys. Russia will be led by Leonid Slutsky this summer, who since taking over from Fabio Capello last year has won 6 of his 9 games in charge, and the 3 he lost were friendlies, so they look in good hands. In addition to his impressive start as Russia manager, he led his club CSKA Moscow to their third league title since he took over in 2009 and that pedigree of success will be very much welcomed in the camp. The 2008 semi-finalists will be looking to make the latter stages of a major tournament for only the second time since 1994 and they will have to edge out some good teams in this group to do so. They are strong enough to beat Slovakia and Wales to make 2nd place if they play to their full potential but this group is wide open and it is difficult to predict. If they do progress from the group I can’t see them getting much further and a last-16 exit could well be on the cards. Gareth Bale – Whilst it would be unfair to call Wales a one-man team, they are not far off. Bale has scored more goals for Wales (19) than all the other strikers in the squad combined and the next best scoring outlet for this side is Aaron Ramsey who to his credit has scored 10 from midfield. The Real Madrid winger can do it all; attack, defend, create and score and as a result he is well and truly the heartbeat of this team. If Bale is on-form, Wales can win any of the games in this group, if he’s not they will struggle – it really is that simple. When you have to rely so heavily on one player, it is hard to expect an awful lot at this sort of tournament. This will be their first appearance in the finals of a major tournament since 1958 and the second in total. None of this squad have ever been to a major tournament for their country and whilst they have players such as Bale and Ramsey who have played in big games, this is different stage altogether. If Bale crumbles under the pressure of the nation on his shoulders it is hard to see any real success for Wales but even if Bale does produce the goods, progressing further than the last-16 would be an over-achievement. Marek Hamsik – Hamsik has made 86 appearances (scoring 18 goals) for his country already by the age of 28, showing just how important he is to his international squad. With Slovakia calling up just two forwards, who have only 7 goals in 43 games between them it is vital Hamsik chips in with the goals for his side, proving once again that he is the main scoring outlet. He scored 5 in qualifying (2 more than Adam Nemec) and also scored last time out against Germany in a friendly, so he will be looking to reproduce such returns on the big stage. An important player for club and country the creative midfielder will be relishing the opportunity to represent Slovakia at a majors finals for only the second time since making his debut in 2007. He has only played in one major tournament (2010 World Cup) and he failed to score so he will be looking to make amends this time around. They only lost twice in qualifying (both times to Austria) and a memorable victory over Germany on the 29th May will give the side some hope but as aforementioned this is a tough group to solve. Whilst I wouldn’t go as far to say that England are nailed on to win the group I would say they are very much guaranteed to take one of the top-two spots. This leaves one, possibly two spots left for Slovakia to take, meaning they will need to raise their game to a level above both Russia and Wales to guarantee a spot in the last-16. I don’t see them getting further than the last-16 if they do progress, and Hamsik and co. will be happy to get out of this tough group.